Hired your new Frozen castle at the weekend for my grandchildren they loved it thank you so muchDorothea. dalmatians slide bouncy castle hire warrington. 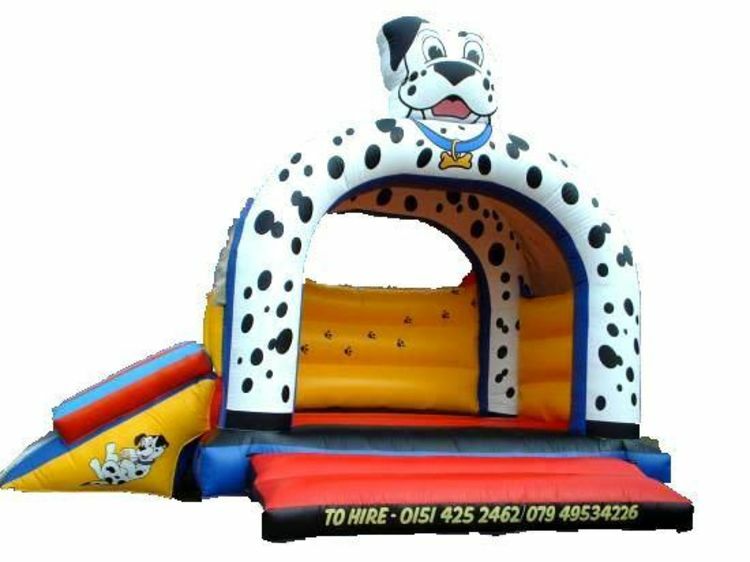 Our 15ft x 21ft dalmatians castle slide features artwork of a dalmatian dog,paws print and both arches of the castles is white with black ploches.This bouncy castle is very popular with both young girls and boys.This themed bouncy castles has a raincover so whatever the weather you can still have fun on our Dalmatians slide themed bouncy castles.The required space is 17ft x 23ft,the height is 12ft,If you are wanting your bouncy castle in a indoor venue make sure the ceiling is heigher than the bouncy castle height.We deliver our themed bouncy castles, inflatable slides,rodeo bull hire,plus are assault courses and adult bouncy castles and domes,to Merseyside & Liverpool, Widnes, Runcorn, Wirral,Warrington, and St Helens, and some of these areas and further areas will be a additional fuel charge or toll/tunnel charge.Check our delivery checker on our home page,it will tell you if there is a charge for your area.